German Potato Salad is the perfect recipe for all occasions. Full of robust flavors and textures, this salad will definitely be a crowd pleaser at any backyard barbecue or potluck this summer! 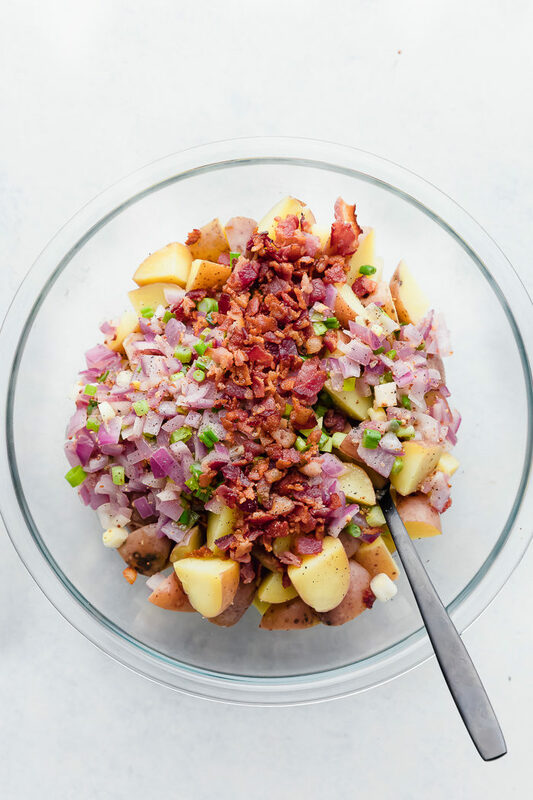 Baby red potatoes are cooked until tender, then tossed together with crisp bacon and red onion. A light and tangy mustard dressing covers the entire mixture while green onion and parsley are the perfect garnish. This side dish is so easy to make and is a delight to share with your friends and family! 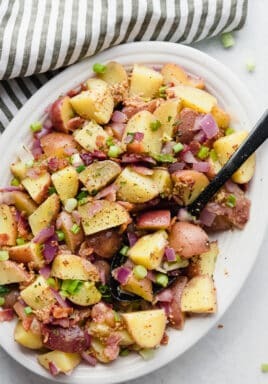 This warm German Potato Salad will go perfectly along side Oven Baked Pork Chops, Slow Cooker Balsamic Roast Beef or Honey Garlic Roasted Pork Tenderloin. Pin it to your SALADS BOARD to save it for later! 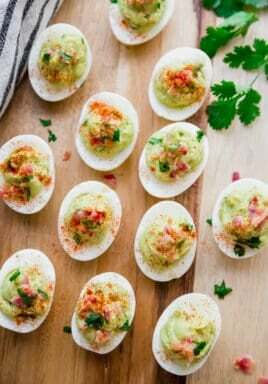 Are you the one who is always looking for a delicious side dish to bring to a party or backyard BBQ or do you have a “go to” recipe that is a sure thing? Well if you are either of those people, this authentic German potato salad recipe is going to make you the Queen or King of the party and take your “go to” recipe up a notch. 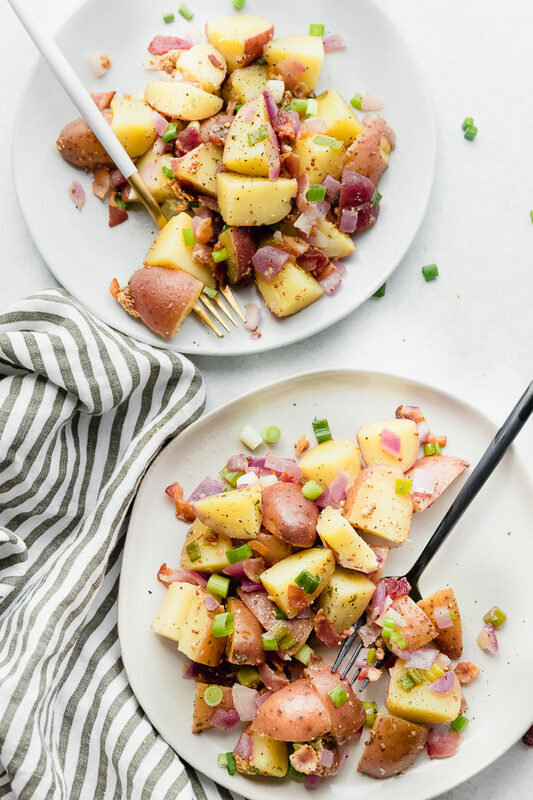 Potato salad is always a crowd pleaser, but this warm German potato salad recipe is flavored with bacon and a light and tangy vinaigrette that will add just the kick to the party you are looking for. Hey everyone this is Shannon from The Food Cafe, and if you are a fan of sides salads, you may also like trying this creamy caramel apple salad with snickers, or creamy grape salad, both are major crowd pleasers. Cut up 2 pounds of baby red potatoes and place in a large pot. Fill the pot with water to cover potatoes and bring to a boil. Allow to boil 10-15 minutes until potatoes are tender when pierce with a fork, drain and set aside. Cut 8 pieces of bacon into small pieces and cook in a large skillet until browned. 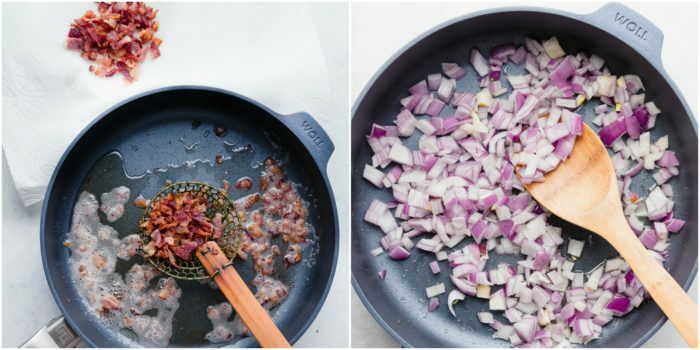 Remove bacon form skillet and place on a paper towel and set aside. Pour 1 tbsp of bacon grease over potatoes and reserve the remaining grease in the skillet. Add in diced red onions and sauté over medium heat until tender. Add in stone ground mustard, sugar, apple cider vinegar, water, and avocado oil, whisk to combine and add in the green onions. Allow to simmer for 3 minutes. 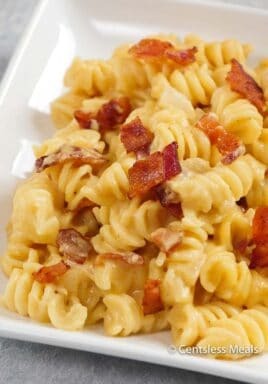 Place potatoes in a large mixing bowl and pour vinaigrette and diced bacon over the top and mix. Garnish with additional diced green onions, dried parsley, and salt and pepper. Can I freeze German potato salad? A usual potato salad recipe contains mayonnaise which can separate upon freezing. So while this will not change the taste, the consistency may be compromised. This German potato salad however does not contain mayonnaise, so freezing it will not be a problem. Place the salad in an airtight container or sealable freezer bag to freeze. It can last in the freezer for 3-4 months if stored in this way. To thaw it, place the container in a sink with very cold water and continue to refresh the cold water until fully thawed. Alternately, you can thaw it in the refrigerator overnight. How Long Does German Potato Salad Last In The Refrigerator? Should you choose to simply refrigerate this German potato Salad, it will last 3 to 4 days placed in an air tight container. But in my experience, it is so delicious that I rarely have leftovers! 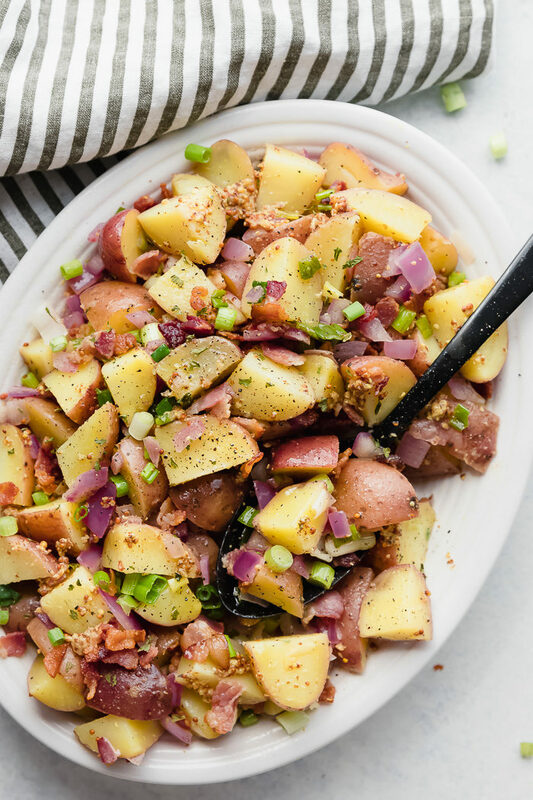 If you are looking for the next big thing to bring to your neighborhood potluck, this warm German potato salad recipe is all you need. Quick, easy to make and absolutely bold with fragrant flavors, this salad will need no introduction and will be gone in a heartbeat. Make this German potato salad your “go to” side dish, I promise you will be happy that you did. German potato salad is the perfect recipe for all occasions. 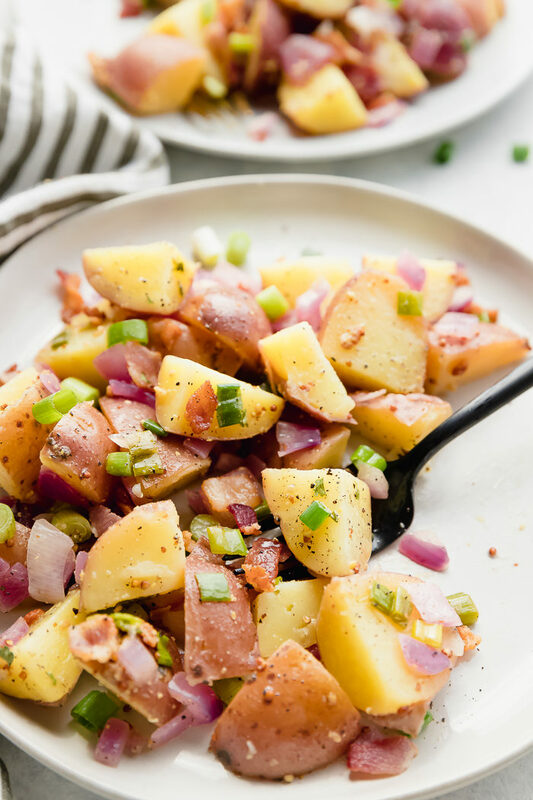 Full of robust flavors, tender baby red potatoes and seasoned in a light and tangy sauce, this salad will be a crowd pleaser. Cut up 2 pounds of baby red potatoes and place in a large pot. 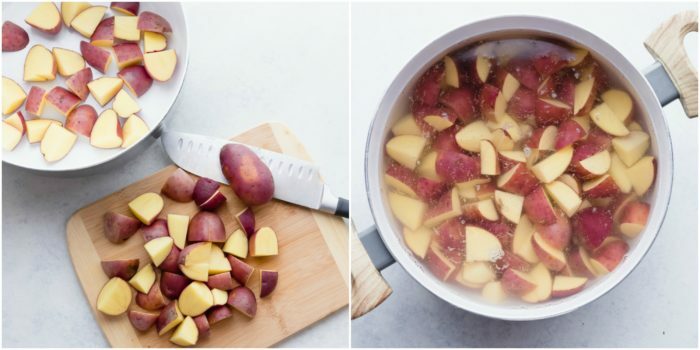 Cover potatoes with water and bring to a boil. Allow to boil 10-15 minutes until potatoes are tender when pierced with a fork. Drain and set aside. Cut 8 pieces of bacon into small pieces and cook in a large skillet until browned. 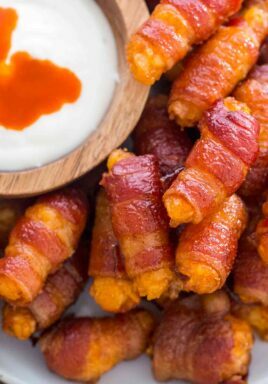 Remove bacon, place on a paper towel and set aside. Pour 1 tbsp of bacon grease over potatoes and reserve the remaining grease in the skillet. Sauté red onions in skillet over medium heat until tender. Add mustard, sugar, vinegar, water and avocado oil. 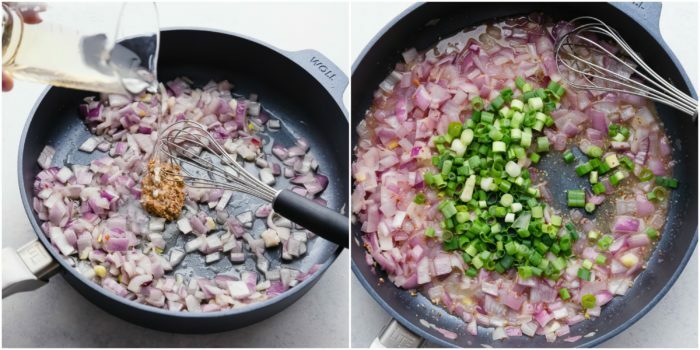 Whisk to combine then add green onions. Allow to simmer for 3 minutes. Place potatoes in a large mixing bowl. Pour vinaigrette mixture and diced bacon over the top and mix. Garnish with additional diced green onions, dried parsley and salt and pepper. Shannon is an Arizona transplant who traded the rain for a life in the sun. Her daughter is like having 5 kids in one so her "me" time is found outside running or in the kitchen cooking and creating recipes families will love. Shannon graduated with a Degree in Biology and went on to get her post-baccalaureate degree in dental hygiene. She feels the way to make people smile and come together is through good food, so she tries to create meals that will not only be easy to make, but delicious to eat. Shannon's philosophy is, when all else fails, have a dream. So that is what she tries to do; dream, create, and bring her recipes to life from her kitchen to yours. Visit Shannon at The Food Cafe to learn more.